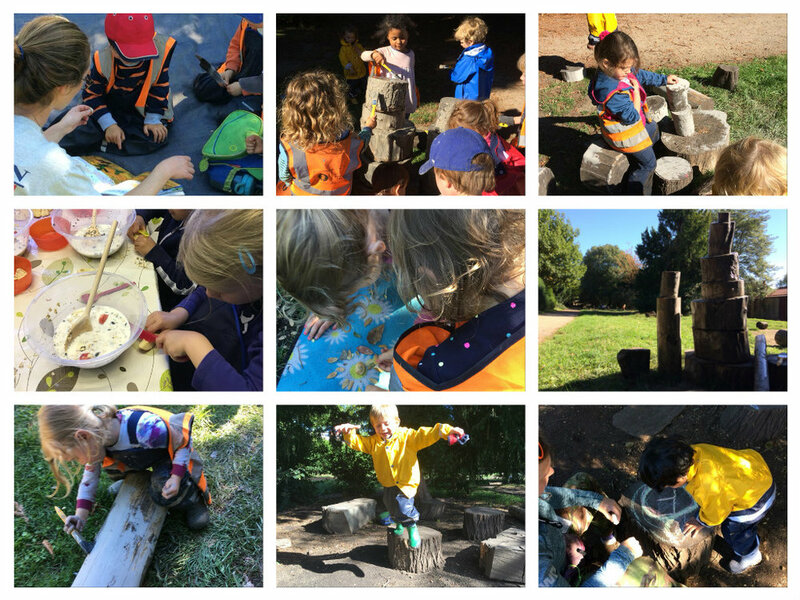 The children have creatively transformed the forest this week with the introduction of a large block of clay. It was an opportunity for everyone to explore the properties of the material, discussing how it feels, where it comes from and what it could be used for, and at that point their creative imaginations took over! Some of the children decided upon using the clay to create their own pots inspired by the ceramics they sometimes discover in the Palace gardens, some made ‘clay food’ for their concoctions in the mud kitchen and others discovered how to make clay into paint! It was really delightful to observe how the clay was interpreted in so many different ways and through experimentation the children’s ideas evolved throughout the week, whether refining their pottery skills or finding new ways to combine the clay paint with natural structures they created. We have also been looking at ‘The Tiny Seed’ by Eric Carle, with the children immediately making the link that it is Autumn in the forest just like in the beginning of the book. They commented that “All the seeds are starting to drop out of the trees”. The idea of going on a seed hunt was then suggested, so off we went to see what we could discover.